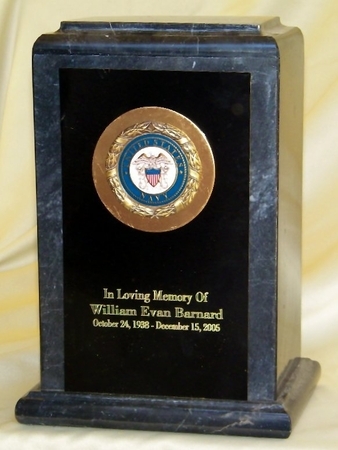 Beautiful genuine grey/black marble urn with brass plaque embellished with United States military medallion and custom engraving to your specifications. This is the same type of natural genuine marble you see in military cemetaries like Arlington. You may call us with engraving details or if you prefer not to call enter the words you want under your email address in the "engraving" section when you checkout. SHIPPING IS FAST and FREE-we'll send you an email within a few hours of placing your order with your shipment tracking number.